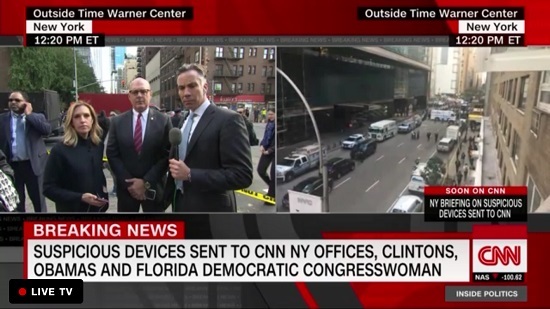 If you were watching CNN Newsroom at 10:09 ET yesterday, and had the sound on, you heard an alarm going off near the studio set. If the sound was off, you probably noticed anchors Jim Sciutto and Poppy Harlow reacting to something out of the ordinary. “I’ll be honest, my first thought was, ‘Can we ignore the fire alarm?…Can we stay here, the both of us? '” Sciutto told TVNewser this morning. “My first thought was, ‘Is this a mistake? '” added Harlow. 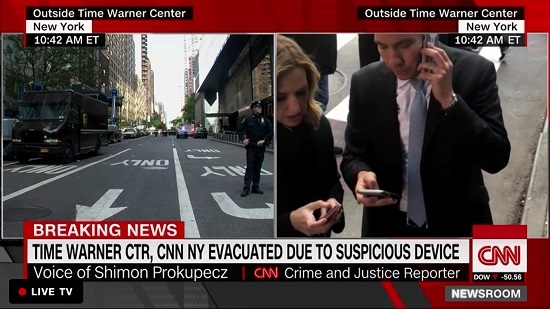 It wasn’t: CNN New York’s entire building was evacuated after a bomb was found in the mailroom. With the help from their studio crew, Sciutto and Harlow were able to lose their mics and their IFBs, bolt from the desk, run down six flights of stairs while calling sources and then—with the help of their production team—somehow continued to anchor the broadcast from West 58th Street. From a cell phone. Sciutto and Harlow’s coverage went viral, and has earned praise from CNN colleagues and journalists at other networks, including FBN’s Trish Regan. TVNewser: OK, so what’s happening at 10:09 a.m.? 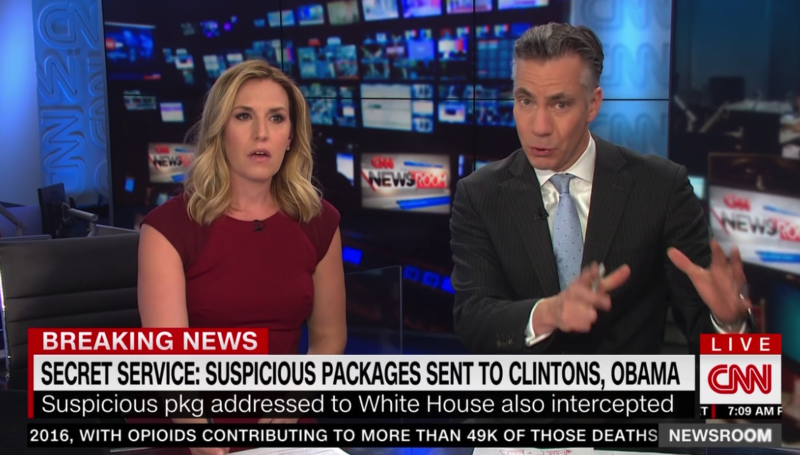 Jim Sciutto: We had just reported the latest on the suspicious packages the Clintons and Obamas had received. Then lights went off and the studio crew said we had to get out because the announcement didn’t give us an option; it said, “You must evacuate immediately,” and the whole team went. There was no choice. The thought did occur to me as we were walking down the street, could there be a secondary attack? Because a bomb threat is a good way to get people out on the street, and thinking in terms of terrorism, that thought occurred to me. 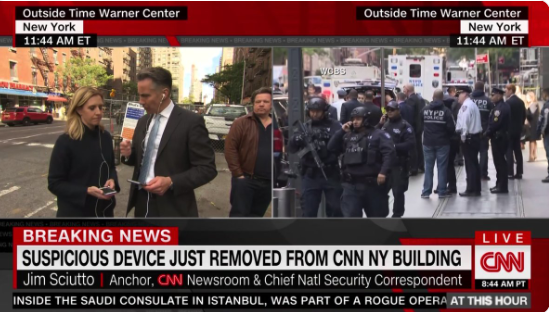 But, CNN security was great and the NYPD was great. We felt well taken care of. Poppy Harlow: Everyone around us put their jackets on, and made a beeline to the door. The lights went dark on our set, they took out mics off, the IFBs out of our ear and we were out of there. But by the time we walked down six flights of stairs, in the back stairwell towards the street, Jim had already confirmed with his sources that there was indeed this explosive device inside of the building. Within five to 10 minutes from that, we were up back on the air, back anchoring our show from a cell phone, which is just remarkable. The work that the technical staff did, the producers; everyone you don’t see on camera, those are the heroes who got us back on the show so fast. JS: We had this “organism,” I’ll call it, of people around us, like a scrum. We had an AP, producers, our senior producer with us. We had multiple phones. I had my phone that I was using to call sources, and Poppy did as well. Then we had phones lent to us, to be our IFB in effect to the studio. Then, of course we’re running out of power, so we had someone else connecting us to power sources. And then someone was Skyping us on their phone, one of the guys from the studio, while they got the camera up. We also had the police moving us as we’re broadcasting; that whole unit had to move in unison; seven or eight of us moving backwards. PH: The producers carried the cameraman with his tripod while we were live on air! Jim, you have reported from war zones. I hesitate to compare the two, but did that experience come in handy during your reporting yesterday? JS: It did. just in some of the of situational stuff. My initial thought of a secondary attack was based on covering bombs in Baghdad. You get there and you knew that was part of the MO [modus operandi], so you had to be aware of that. Listen, these are not the streets of Baghdad, but terrorists, whether domestic or foreign, copy each other’s tactics. So, the thought definitely occurred to me. I think the other thing is just, covering Iraq and Afghanistan, the idea that journalists are off limits disappeared long ago. The idea of wearing a little badge and putting TV on your helmet, if anything makes you more of a target, post-9/11. That changed our behavior very quickly in places like Iraq and Afghanistan. So, now to have the threat at least, to media here at home, it’s jarring. Poppy and I both have kids, and both of us said to each other yesterday that our first thought was our kids. You want to be there with them, and for them. So, definitely that experience was in my mind. To follow up on that, Poppy, you have a very young family. Your job, when you’re running down those stairs, is reporter. How do you reconcile the two in a time like this? The NYPD, all of the CNN security guards that were are around us. I didn’t hesitate. There was nothing I could do in that moment. I couldn’t go to Brooklyn and get my daughter. I couldn’t make it home. It was just about finishing our job. Obviously, I messaged my husband and told him what was going on and that we were fine. I called my daughter’s school in the commercial break, and told them I was going to be late today. I want my kids to know how important a free press is, and yesterday I felt like we were standing up for that in the best way we could by doing our jobs. CNN president Jeff Zucker put out a statement yesterday, condemning the White House’s rhetoric about CNN and the press. The president hasn’t exactly toned down the rhetoric with his tweets this morning, talking about “false and inaccurate reporting by the mainstream media.” What’s your take on that? You were on the scene. JS: Our best retort to that is the work we do. That’s what we did yesterday. We covered the news as we always do. We work our hardest to get it right. Poppy and I were calling sources in the police, and we were double-checking each other. That’s the way we do it everyday. When the president tweets about “intentionally false reporting,” we say no and just look at the work we do. You saw Sarah Sanders this morning talk about how CNN and the media immediately blamed the president. That’s not true. PH: Not only is what she said not true. That hasn’t happened, period. We have reported on the rhetoric. Now, there are other high-ranking officials who have blamed him for the rhetoric and the tone, but no, it’s just so inaccurate. PH: Jim was instrumental in getting [Ohio Gov.] John Kasich on the air today. In the middle of our reporting yesterday during our commercial break, I called [Sen.] Ben Sasse‘s communications guy, and told him that we wanted him on because his voice is so important; he just wrote a book about “civility.” We also had [Democratic Sen.] Chris Van Hollen from Maryland. JS: Asking people from both parties whether the president’s rhetoric adds or to the danger, the atmosphere is not blaming the president. Those are not equivalent. TVN: What’s your general takeaway from yesterday’s events, and how will this influence your reporting going forward? JS: Personally for me, moments like yesterday re-emphasize what our mission is, and give you clarity about what it is we do and why we do it. What’s happening is important, and you want to get it quickly and right, regardless of the challenges, even if there’s a bomb in your newsroom. That for me is re-affirming and satisfying when you have the opportunity to do that. PH: I knew immediately within the first few minutes that I have a hell of a partner in Jim. Beyond being a colleague, he was looking out for me as a friend. I could feel that on the street. Second, it’s the people around us whose faces you don’t see on camera that got us on the air and kept us on the air all day. Those are the people whose faces you don’t see. They don’t have the biggest paycheck, but they do incredible work here everyday—and especially yesterday.